(L to R): Rusty Bishop, CEO, Federated Auto Parts; Michael Cardone III, executive chairman, Cardone Industries; and Bo Fisher, chairman, Federated Auto Parts. STAUNTON, Virginia, May 22, 2018 - Michael Cardone Jr., co-founder of Cardone Industries, has been inducted into the Federated Auto Parts Vendor Hall of Fame. 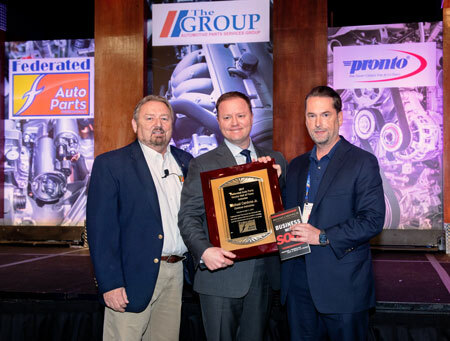 The Federated Hall of Fame induction took place during the recent Automotive Parts Services Group meeting in Grapevine, Texas. Cardone’s son, Michael Cardone III, accepted the award on behalf of his father. A copy of “Business with Soul” was handed out to everyone after the awards. In 1970, Cardone Jr. co-founded Cardone Industries Inc. with his father. Since 2014, Cardone has served as chief strategy officer for the company and is a member of the board of directors. Before assuming his current role, Cardone served as chairman, CEO, president and COO of Cardone Industries Inc. In 2001, he was honored by the Automotive Warehouse Distributors Association (AWDA) with its prestigious Leader of the Year award. Cardone has also been honored by the American Society of Quality Control, Northwood University and several other organizations throughout his illustrious career. The Federated Vendor Hall of Fame recognizes one individual each year who demonstrates dedication to excellence, helping to make a difference for Federated and its members. For a list of recent inductees, visit http://www.federatedautoparts.com/HallOfFame.aspx. Federated Auto Parts, headquartered in Staunton, Virginia, is one of the largest auto parts distribution and marketing organizations in North America. Federated is dedicated to supporting its customers with quality name brand parts, programs designed to grow their businesses, and experienced people who are knowledgeable in today’s evolving automotive technology. For more information, visit www.federatedautoparts.com.